Hacking The Planet is an original series for The Weather Channel that I created with Chris Cassel of Castle Pictures, and which I hosted. Each episode looked at whether current or future technology might allow us to better control, predict or protect ourselves against some dangerous force of nature. The program debuted on February 28, 2013. The six 30-minute episodes of Hacking The Planet focused on hurricanes, tornadoes, lightning, precipitation (including rain, snow, and hail), earthquakes and volcanoes. The show also inspired a one-hour special, The Truth About Twisters, that debuted on The Weather Channel as part of its Tornado Week programming on May 1, 2013. 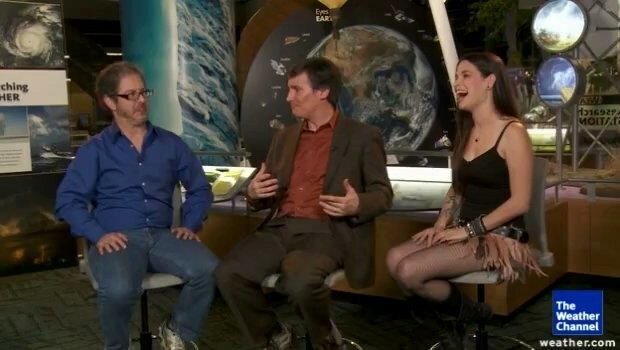 My co-hosts in both the series and the special were Brian Malow and Cara Santa Maria. Brian, a.k.a. Earth’s premier Science Comedian, was a regular contributor to Neil DeGrasse Tyson’s radio show Star Talk and starred in a series of science videos he produced for Time.com. He worked in outreach for the North Carolina Museum of Natural Sciences. Cara, trained as a neuroscientist and a former senior science correspondent for The Huffington Post, hosts the popular Talk Nerdy with Cara Santa Maria podcast. and is one of the Rogues at The Skeptics' Guide to the Universe podcast. This clip from the “Hacking Hurricanes” episode captures the flavor of the show nicely. More episode clips and exclusive behind-the-scenes webisode videos can be found here. Here’s a gallery of images taken from the show and from behind the scenes. The promotional title card for the show, from a commercial on The Weather Channel. Examining a model of one of the devices that LEC in Boulder, Col., uses to protect locations from lightning. Speaking with Weather Channel hosts by video just before the debut of Hacking The Planet. From "Hacking Hurricanes," a shot of me in mid-web chat with Cara and Brian on the campus of the University of Miami's Rosenstiel School of Marine & Atmospheric Science. At NASA's Wallop's Island flight facility, inside the "science trailer" where data beaming back from a Global Hawk drone flying over tropical storm Nadine is processed. Standing in the hurricane simulator at the University of Florida, Gainesville. Just after a chilly dawn in Lubbock, Texas. Snowboarding for the cameras in Vail, Col., as I discuss the science of snowmaking.